This HAS to be THE most fitting tribute to microradio ever put to wax. There is no other way to describe it than simply amazing. Songwriter and spearhead front man Michael Franti hails from Santa Cruz, California, and has had ample opportunity to soak up the seditious programming of the infamous Freak Radio Santa Cruz. Last year, he even wanted to take some of the FRSC crew with Spearhead on tour to operate a mobile microradio outlet for each show. The idea never materialized, but it's clear Franti's been thinking about the issue. Michael Franti has a long history of mixing music with activism, starting with his first foray, the Beatnigs, which played a definite mixture of angry yet thoughtful music and put Franti on the map as an artist to listen to. 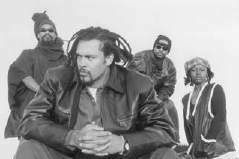 The early 1990s saw the Beatnigs break up, but Franti teamed with more comrades to form the Disposable Heroes of Hiphoprisy. This definitely embraced a more beat-driven sound, but still contained a powerful message - as exemplified by the college radio hit single "Television, the Drug of a Nation." This was the closest Franti ever got to being a pop star. The Disposable Heroes were signed to Island Records and even toured with U2. After only two albums (the second a being a collaboration with legendary wordsmith William S. Burroughs), the Disposable Heroes were trashed. Not because their popularity was on the wane - because getting any bigger meant sacrificing music over message. In 1994, Spearhead was formed. According to the group's website: "Michael decided after speaking out in such a confrontational in your face way that he would still stay true, but to do it in a different approach. This would be to have consciousness in the music , but also bring the music so people could dance and have a good time as well." It definitely hit the spot, and Spearhead then embarked on what would become one of many frequent and intimate tours around the country, building a remarkably committed following of "Spearits" who love the music and its messages of self-respect, love, and critical thinking about the world and our place in it. Our feature track, "Listener Supported," was released on Spearhead's third album, Stay Human. It is a track that is an out-and-out endorsement of the microradio movement, and Franti speaks well for us all. It logically became an instant classic among microradio stations worldwide. Songs like these are true gems - but there's two of them on Stay Human. The second was the lead-off single "Rock the Nation (the Dawning)," which also draws heavily on a theme of media revolution, and spawned a VERY cool video. Even the album itself draws on a pirate radio theme; each track is placed in the context of a mythical pirate radio station who's broadcasting continuing coverage of a wrongfully-convicted activists' execution. These "voice breaks" between songs provide a separate story, with its own message. It's a beautiful blend of the power of words and music.